"I have some pictures that I want to put into a youtube video, but I don't know how to do that. I have a Mac if that changes anything. Do I need a special program? Also I wanted a put a song in the video, so how would I do that too?" To create a YouTube slideshow video, the best and easiest software to use is Photo Slideshow Maker for Mac. This piece of slideshow software lets you make a slide show of your photos and encode the slideshow into video with ease. You can add music to the slideshow, apply transitions, choose theme, set Pan & Zoom, and more. Now let me show how you can create photo slideshow video for YouTube using this Mac slideshow maker. In the Images tab, you will be able to browse all the photos in your Mac. You can drag photos from iPhoto library or other folders in your Mac hard drive to the timeline. 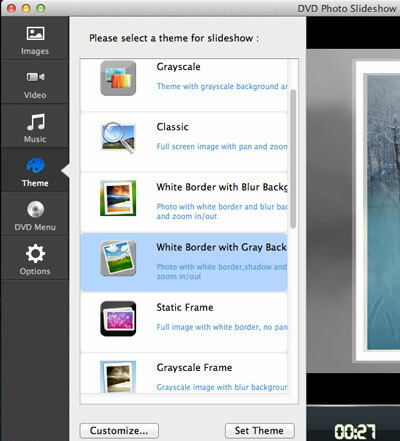 Click the Theme tab, and you can select a theme for your slideshow. You can also click the Customize button and select a background image for the theme. By default, the transition effects will be applied randomly and marked as dice icons. You can click the dice icon and select the transition effect you like. You can also choose to apply the transition to all photos. Click menu DVD Photo Slideshow Professional -> Preferences... to go to the Options window. There you can specify the path and format (MP4 or MOV) for the output file. 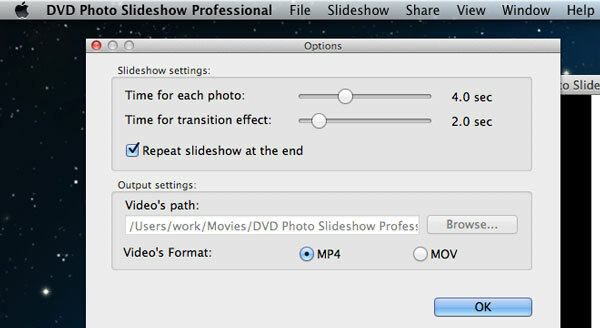 To upload the slideshow video to YouTube, you can choose either MP4 or MOV as the output format. 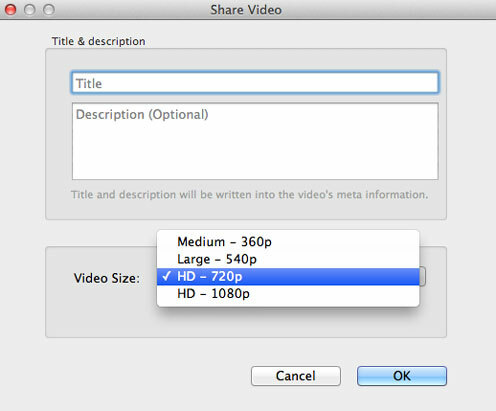 In the Share Video window, you can write title and description and set Video Size (Medium - 360, Large - 540p, HD - 720p or HD - 1080p) for the output video. 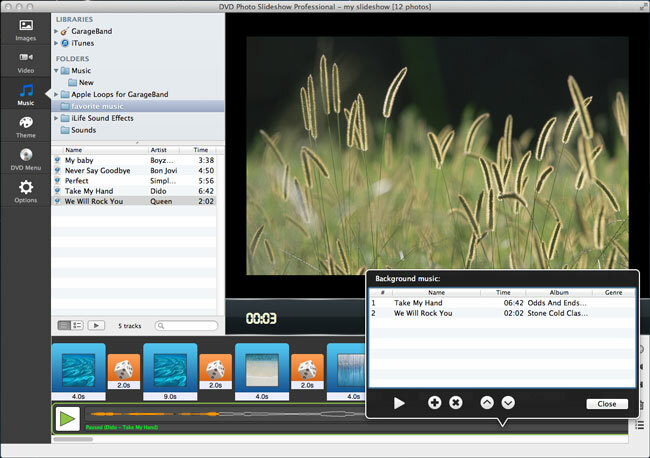 When the encoding is done, you will get the output slideshow video in the output folder specified in Step 4. 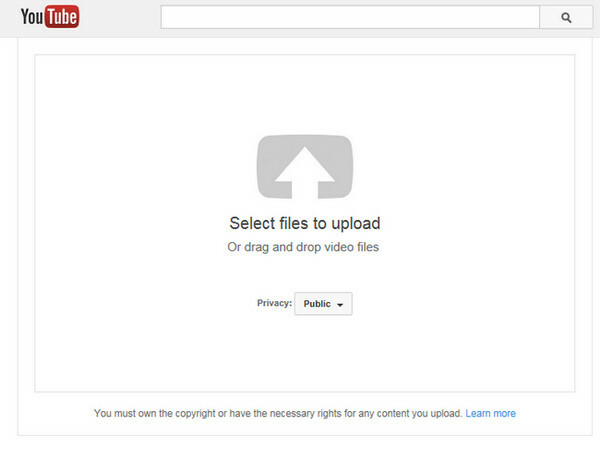 From there, you can upload the slideshow video to YouTube and share with your friends.